Suria was a 38-year old man from Indonesia. He came to Penang for his wife’s operation but instead found himself to be suffering from liver cancer. For the past 20 years he had gastric problems and since the last ten years he had blurry visions. His daily diet: ayam goreng (fried chicken). 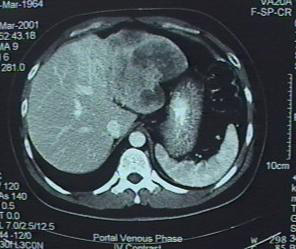 A CT scan of the liver dated 2 March 2001 indicated a lobulated mass seen in the left lobe of the left liver. This possibly represents a hepatoma. The small nodular lesions seen in the right lung possibly represent metastatic lesions. My understanding was that I would be cured. That was what I thought all along. Now the doctorpusing sedikit (twist a bit) and told me that he only guaranteed 98% that the operation would be successful. But he only told me all this after he had operated on me.